The Regional Consultative Committee on Disaster Management (RCC), established in year 2000 by the Asian Disaster Preparedness Center (ADPC), serves as a non-binding mechanism to develop action strategies for disaster risk reduction (DRR); promote cooperative programs at regional and sub-regional levels; and provide guidance to ADPC on its future work and strategies in Asia and the Pacific. The RCC is comprised of National Disaster Management Offices (NDMOs) of 26 member countries. It promotes peer advocacy and exchange of expertise in reducing disaster risk and enhancing climate resilience. The RCC mechanism, together with other agencies, assists countries in implementing the commitments of the Sendai Framework for Disaster Risk Reduction (SFDRR), the Sustainable Development Goals (SDGs), the Paris Agreement on Climate Change, the Agenda for Humanity, and the New Urban Agenda. As the Secretariat to the RCC, ADPC is committed to bringing countries in Asia and the Pacific together to achieve common goals in DRR. 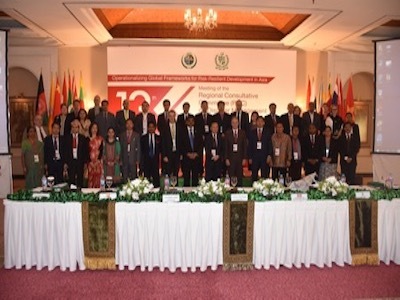 The RCC meetings are hosted by different member countries in Asia and the Pacific. Each meeting holds a specific thematic focus which provides a useful opportunity for member countries to exchange lessons and share their best practices across professional disciplines. It provides a periodic forum for member governments to share information on national, sub-national and regional priorities and needs with the intention to systematically encourage and facilitate regional cooperation in DRR. To date, 26 countries, namely: Afghanistan, Bangladesh, Bhutan, Brunei, Cambodia, China, Georgia, India, Indonesia, Iran, Jordan, Kazakhstan, Republic of Korea, Lao PDR, Malaysia, Maldives, Mongolia, Myanmar, Nepal, Pakistan, Papua New Guinea, the Philippines, Sri Lanka, Thailand, Timor-Leste and Viet Nam have participated in the various RCC meetings. The RCC continues to expand its role to assist individual countries in developing more comprehensive program approaches for wider application. Each meeting adopts an action agenda and specifically requests ADPC as the RCC's secretariat, to develop national programs and to provide technical support to countries in pursuing their national DRR strategies.